A few weeks ago, Tom Umberg, our local State Assemblyman, was going door to door in our neighborhood. Ostensibly, he was just getting to know the folks in his district and handing out informational pamphlets on the services that his office could provide; realistically, I'm sure he was out walking around because in a few months he'll be running for the State Senate district that also covers our neighborhood. At our house, the person who opened the door happened to be me. After shaking my hand and saying a little bit about his pamphlet, he noticed the Ich wohne auch hier (I live here too!) 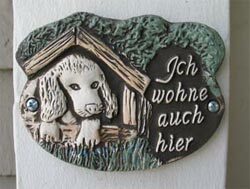 sign mounted next to our front door and asked "Sprechen Sie Deutsch?" ... now that's relationship management! I don't care if he's running against the reincarnation of Mother Teresa — Tom Umberg's got my vote! During a trip to Costco tonight, I learned that you can finally purchase The DaVinci Code in paperback. That should be real helpful for those three people left who might want to read it, but didn't want to spring for the hardback and found a trip to the library too inconvenient.